Published: Dec. 10, 2012 at 11:49 p.m. Updated: Dec. 11, 2012 at 01:14 a.m. It's December. The New England Patriots are peaking on both sides of the ball. Welcome to the last decade. The Patriots are in the driver's seat for a playoff bye after pasting the Houston Texans 42-14 on Monday night in Foxborough. This is a game that will reverberate across the AFC over the next three weeks. The Texans suddenly need to win next week against the Indianapolis Colts or they will have to worry about losing the AFC South. The Patriots, at 10-3, now have a chance to steal the No. 1 seed if the Texans slip up one more time down the stretch. More importantly, New England served notice that its defense no longer is a sieve. The Patriots lead the NFL in forcing turnovers, and they picked off Texans quarterback Matt Schaub early to help build a quick 21-0 lead. A remade secondary looks much better with Devin McCourty at safety, seventh-round draft pick Alfonzo Dennard battling at cornerback and free-agent pickup Aqib Talib on the other side (he hurt his hip in the game, though). Coach Bill Belichick is mixing in more creative blitzes on passing downs, and defensive tackle Vince Wilfork had one of his trademark big games in a big game Monday. 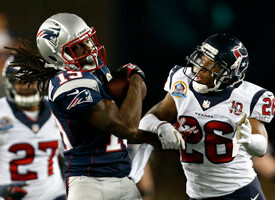 Check out the best photos from the Week 14 matchup between the Patriots and Texans. Tom Brady, meanwhile, threw four touchdown passes in an MVP case-building night. If he strafes the San Francisco 49ers next week, we don't think Peyton Manning has a chance for the award. This was supposed to be a battle of AFC titans. Instead, the Patriots made an 11-1 squad look like the Kansas City Chiefs. Or maybe the Kansas City Royals. The game was such a laugher that backup quarterbacks played for both sides down the stretch. It was the type of loss that lingers. The Texans will enter the playoffs knowing the Patriots outclassed them in every phase in Foxborough. Don't be surprised if Houston has to come to New England again. While the Texans have started to spring leaks, the Patriots are playing their best. It's that time of year.